This time of the year is especially high-voltage at Bioneers. 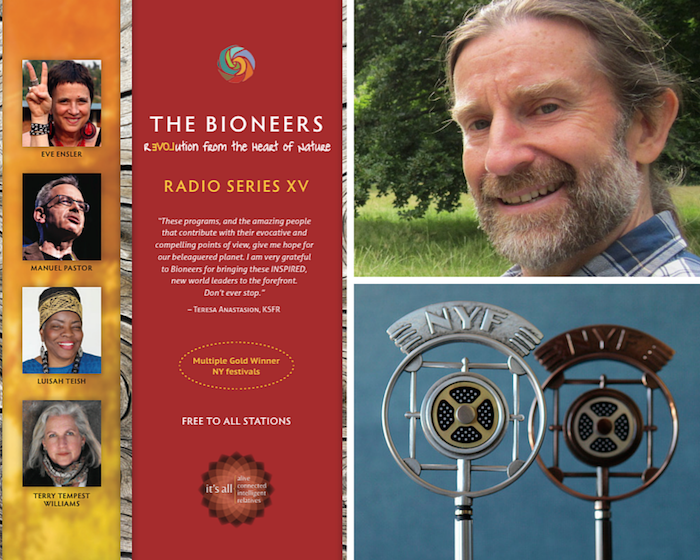 As we’re ramping up for the conference, we also spring brand new radio on the world: The Bioneers: Revolution from the Heart of Nature. Our radio team tells us this may be the finest series ever, in part because the 2014 conference talks were so amazing. Because the series airs on hundreds of stations, we have to release the 13 shows one at a time, as they air. You can now hear the first three, and stay tuned weekly for postings of each new show as it airs. Neil Harvey, Senior Producer and Host of the annual series, recently shared some of his perspectives on what you’ll find in this year’s shows. Neil collaborates on the multi-award-winning series with Bioneers CEO & Co-Founder Kenny Ausubel (Executive Producer/Writer) and Stephanie Welch, Managing Producer. In fact, the series exists because Neil started coming to the conference in the late 1990s, and hooked Bioneers up with his team at New Dimensions Radio, who partnered with us get the series off the ground in 2001. Neil says that one striking characteristic is the prominence of the feminine voice. Four shows focus on women’s leadership and the archetypal feminine, and three more feature exclusively female voices. Neil says another highlight is the humor of several of the speakers in this series, especially in these often-dark times. While these are mightily serious issues, it’s vital to keep a light heart and a hopeful mind in order to move forward. This is something that a bioneer possesses. Please give us your feedback when you hear the shows, and help spread the word! We want to give a big shout-out to our hard-working radio team. Beginning with extensive prep work before the conference each year, the radio team works tirelessly throughout the year to create the polished, award-winning shows that are heard worldwide. And just won 12 national-global awards! We offer a deep bow of gratitude to our radio sponsors, Organic Valley Family of Farms and Mary’s Gone Crackers. And to all of you who support the radio series and Bioneers at large! We’re able to get the series out so widely because of your generous support. You are keeping Bioneers Radio freely available to the public and spreading game-changing solutions and ideas that are truly changing the world.